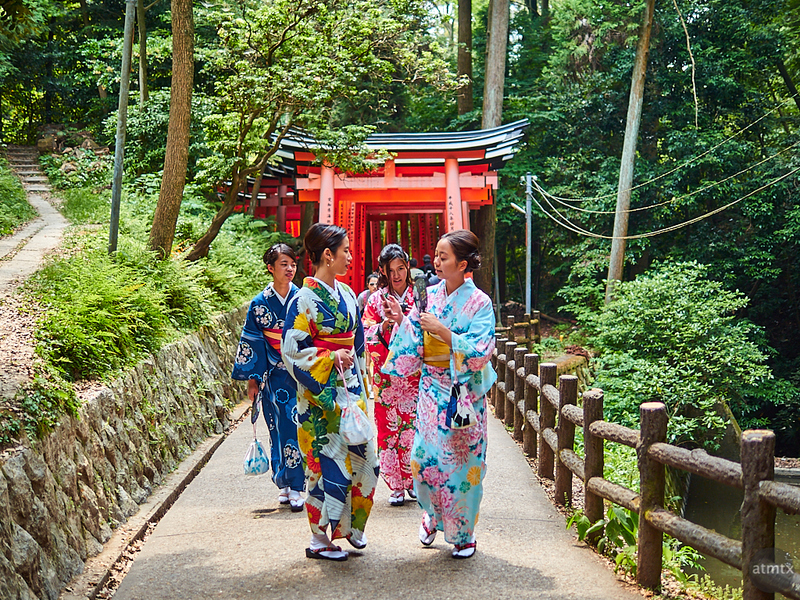 One of the common things I saw this time, during my visits to the Japanese tourist sites, are people dressing in kimono, the traditional Japanese clothing. I saw more women dressing up, though there were a few men also, but only when they were a part of a couple. I think the majority of the kimono folks are visitors from outside Japan. I can see the attraction, I suppose. Japan has a distinct culture and to live in that simulated lifestyle, if for only a few hours, may be interesting. Modern Japanese still were kimono, but only during special occasions. During New Year’s celebrations, both men and women wear kimono when going to the shrines and temples. There are also special wedding kimonos. In downtown Kyoto, I occasionally see older women wearing everyday kimono but less so in Tokyo. I took this photo at Fushimi Inari-taisha, in a clearing between banks of torii tunnels. The scene looks very Japanese to me, with the women in Kimono, the lush green vegetation, the stacked stone wall and, of course, the bright red torii in the background. I’m fairly sure, however, the women are not Japanese and are tourists visiting from afar. Lots of Asian tourists are keen to try yukata in Japan I also saw a lot and the Japanese government encourages this by giving reductions to people wearing yukata. It’s quite pretty and a lot of shops have opened to rent yukata and kimono for the day. Hi Mchan, thanks for your visit and comment. Interesting, I didn’t know places give discounts for wearing a kimono or yukata.